According to a briefing released last year by the U.S. Department of Veteran Affairs, at least 22 Armed Forces veterans commit suicide every day in America. Mental health professionals estimate that nearly one quarter of all veterans returning from Iraq and Afghanistan suffer symptoms of Post-Traumatic Stress Disorder or major depression. Furthermore, there are 76,577 veterans living in Suffolk County, the largest veteran population in New York. 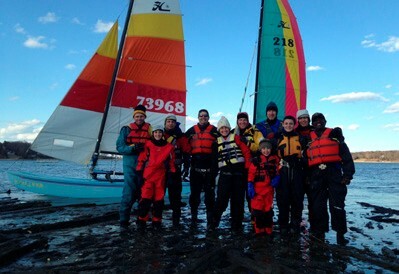 It is because of the above reality that the Long Island brothers Kilian Duclay (18) and Sean Duclay (16), with the enthusiastic support of their family, friends and Oakcliff Sailing in Oyster Bay, have dedicated themselves and their sailing expertise to providing effective sailing therapy for traumatized and wounded veterans. Having co-founded a not-for-profit organization called SailAhead, they have changed sailing from a hobby to a mission: Helping our veterans. “Even though at times it can be seen as extreme, this sailing activity is not dangerous!” Sean asserts. 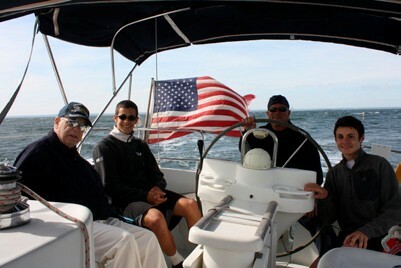 “Taking veterans sailing provides an often new and definitively liberating experience. Veterans are exposed to new sounds, new feelings, new or renewed social interaction and new types of challenges. Learning to sail and being supported by others while on a sailboat in the middle of the ocean exposes our veterans to positive and constructive stress. It forces each veteran to work with other unfamiliar veterans to make a team that gets the boat moving! The veterans returning from sailing trips are energized, eager to set sails again and relish the mental freedom sailing provides. Other members of the SailAhead team include Skippers Pascal Blotiau and Thierry Duclay (Kilian and Sean’s father); Advisor Frank Ostroff, a U.S. Navy vet who served aboard the USS Kenneth D. Bailey; Skipper in Training and Advisor Joshua Hartley, a U.S. Marine Corps Captain who served in Iraq and Afghanistan; Chief Financial Officer Jimmie Spears, a proud veteran of the U.S. Marine Corps; and Mentor Dawn Riley, Executive Director of Oakcliff. Primarily sailing out of Oyster Bay, SailAhead currently has six Hobie Cats and three keelboats. Sail Ahead is looking for help in the form of volunteers and monetary or sailboat donations. “Our fleet is potentially every sailboat moored in every single bay around Long Island,” said Kilian. “This is a work in progress!” To learn more, visit duclay.com and facebook.com/SailAhead. 1) Show appreciation of the sacrifice our veterans have endured for our country. 2) Spread PTSD awareness throughout the community. 3) Spread awareness of SailAhead’s program so that more wounded veterans can be helped. The sailing event will last 5 hours, the flotilla will sail together on the Long Island Sound.